iNotes4You is hosted by Automattic’s WordPress.com. 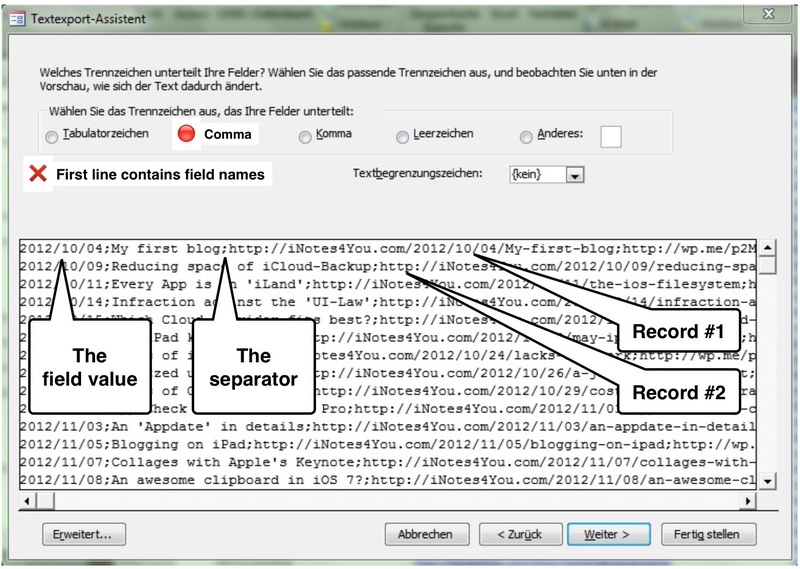 As it is a free blogging platform some useful features for managing the articles are not available, e.g. there is no compact full-screen list showing the titles, the date published and the link of each article. To get a plain overview of all articles I already saved some information on a Windows 7 PC in a Microsoft Access 2010 database. Each record contains the title, the permalink and the short link of an article. The date published can be extracted from the permalink. As I blog on an iPad I want to keep all the information together on one and only one device. So I decided to organize the information about my articles with the help of Tap Forms database (by Tap Zapp Software Inc., Canada). This article describes how I migrated from Microsoft Access database on a Windows 7 PC to Tap Forms database on the iPad. Even if this very special workaround does not apply to your tasks you will find some interesting notes regarding the application of Tap Forms. A CSV file (comma separated values) contains the records, one line for each record, where field values are separated by a comma. Since decades the CSV file format is a standard for exchanging data between applications. There is a feature provided by Tap Forms that allows to include field-type tags in the header row of a CSV file to tell the app which fields are text, numbers, dates or hyperlinks. If you use this feature when importing into the app the table will contain the right field names with the appropriate field types. Although [text] is the default if it’s not specified in the column. 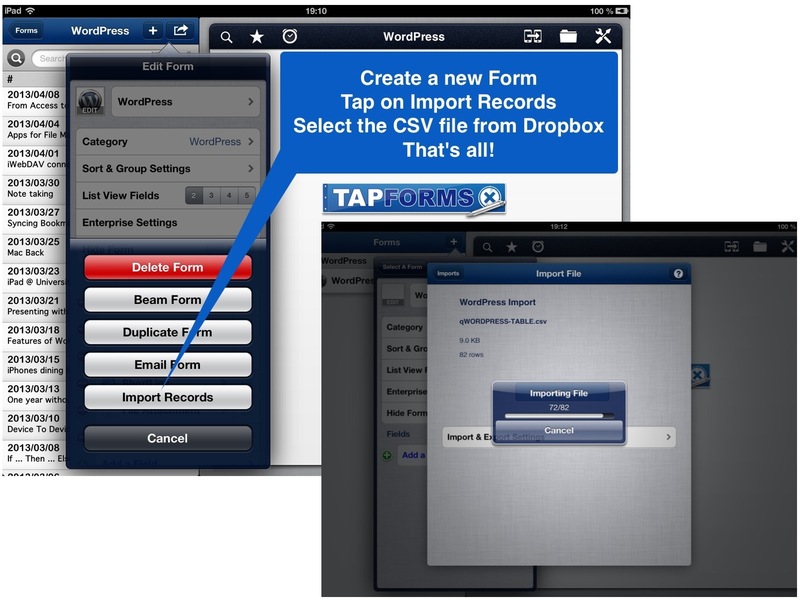 When importing dates the Tap Forms date import format must match the format of the date in the CSV file. 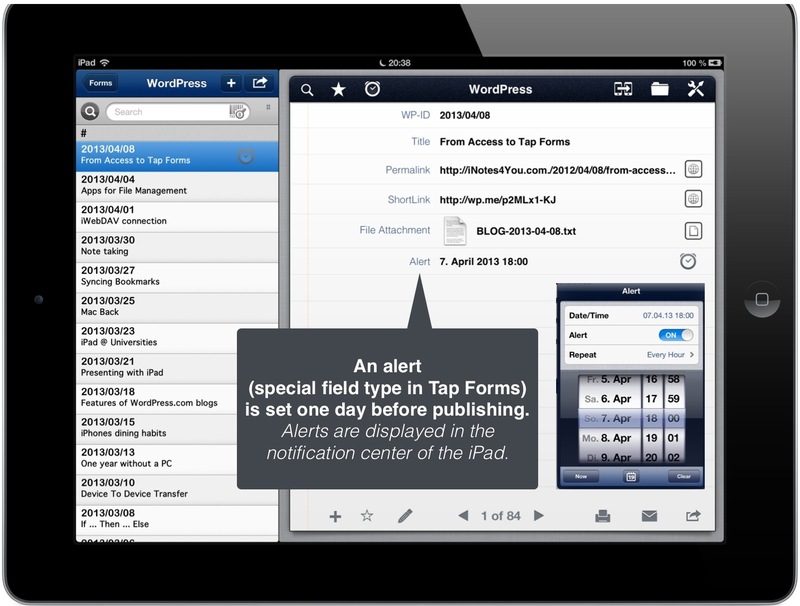 Here is a list of all field-type tags for Tap Forms HD. WordPress deletes all pointed brackets from blogs so I used square brackets; the square brackets must be replaced by pointed brackets. Here are the modified field names in Microsoft Access. A permalink is an URL that points to a specific article of a blog. A permalink remains unchanged indefinitely. Permalinks are often simply stated so as to be human-readable. What is a short link? WordPress.com has its own URL shortening feature, wp.me. These URLs are also permanent. The URL shorteners are useful for inserting them in Tweets as Twitter limits the text length to 140 characters. The database on my iPad should use the publishing date of an article as the primary field. Here is the query which provides this field by extracting the publishing date from the permalink of each article. The records are exported to a CSV file using the above mentioned query and a Dropbox folder as the destination location (because Tap Forms allows access to Dropbox). Here are the right settings for the export. Now we come to Tap Forms. 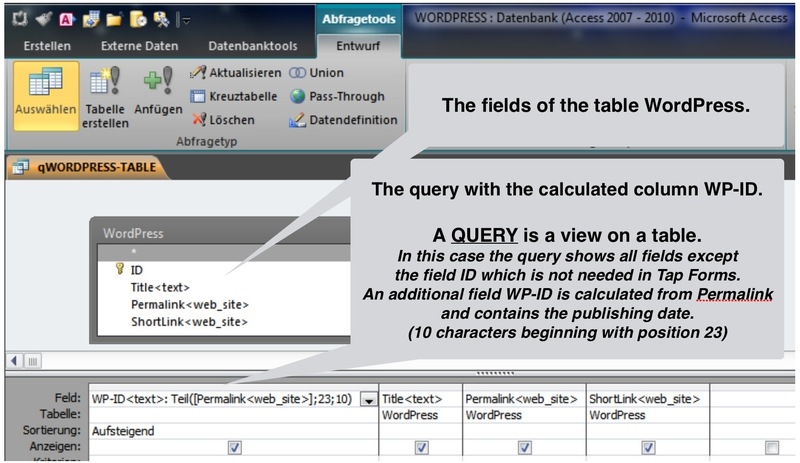 We add a new FORM which, in the notation of Tap Forms is a view on the table containing the imported records. As we already used import-friendly field names we just have to use the function IMPORT RECORDS. That’s all. I want to have access to the source code of each article. So I created an additional field for accessing the source code with field type FILE ATTACHMENT. 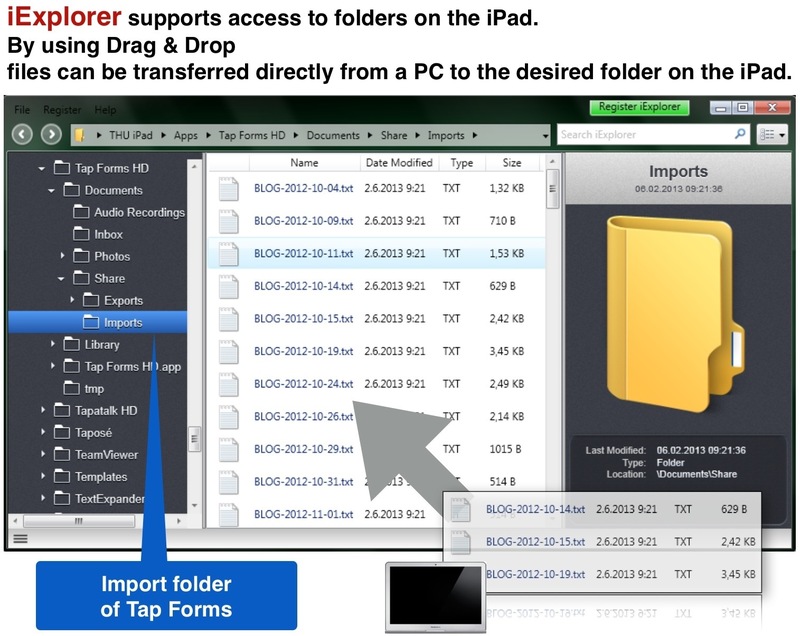 For importing source code files into the imports folder of Tap Forms I used the demo version of iExplorer by Macroplant. After installing the application on a Windows PC it allows you to access the app specific folders on the iPad especially the import folder of Tap Forms. To import all the textfiles just drag them into the appropriate folder. Linking the field FILE ATTACHMENT to the source code files is a painstaking task because you have to do it manually. 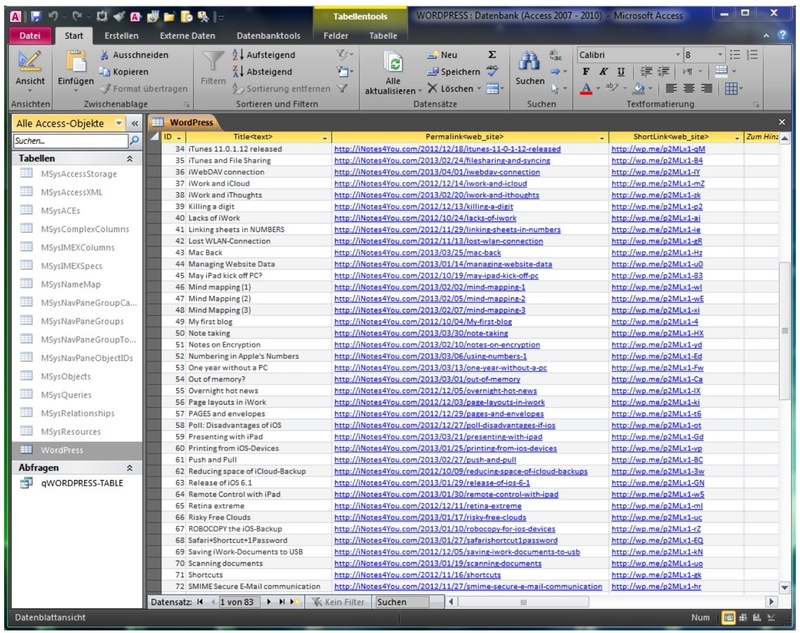 This is the result of the migration process from Microsoft Access to Tap Forms. I added an additional field ALERT to last review the article one day before publishing. If I use Tap Forms on the iPad all information about my articles are accessible on one device. The alert reminds me about an upcoming publishing. For Tweets on Twitter or other purposes I can take the relevant data from a Tap Forms record into the clipboard. 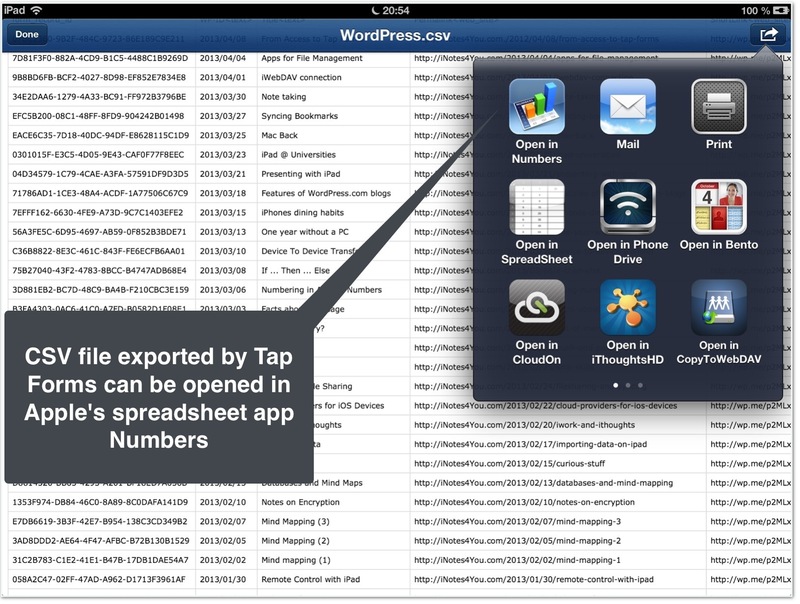 Using the export function of Tap Forms I can generate an updated blog list in Apple’s iWork app Numbers to print it out or use it for other purposes.